A Holiday Message from Sting - In an exclusive message for readersdigest.com, Sting shares his hope of how we all can make a difference this season. See exclusive photos of Sting and his friend Bobby Sager distributing indestructible balls to children in need at readersdigest.com. This month my good friend, philanthropist and adventurer Bobby Sager, and I are launching a new project called HOPE IS A GAME-CHANGER. I believe this initiative has the potential to affect the lives of many children around the world - children born into poverty, war, disease, conflict and for whom the slightest ray of light can ignite a powerful sense of worthiness and joy. The HOPE IS A GAME-CHANGER project will deliver indestructible soccer balls to kids who, all too often, see things crumble, fall apart and not survive the simplest of circumstances. (See exclusive photos of Sting and his friend Bobby Sager distributing indestructible balls to children in need.) The project started taking form well before anyone knew where it would lead - which is a testament to the power of like-minded energies colliding to turn inspiration into action. Four years ago an inventor-friend of mine named Tim Jahnigen was watching a CNN documentary about children living in war zones. Tim was so moved by what he saw he got to work developing a ball with 'indestructible' - or non-deflatable - properties. What better way, he thought, to help a child of war get through their darkest days - as well as combat the rough terrain a regular ball simply can't survive. At about that time, Bobby was in Rwanda doling out help to the people there (Bobby and his family have been helping people in some of the roughest places around the world for the past decade) and snapping photos of a child soldier named Moise with his "soccer ball" - which was essentially a heap of rubbish tied together with a string. 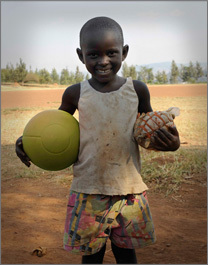 This "ball" was the only thing Moise could call his own - no family, no home, no place to go. Forced to fight in the Congo and having killed three people at the unbearably young age of seven, the boy's spirit was broken. And Bobby knew, as he took one photo after the next, that he'd never forget him. In fact, he and his family returned the following year to tell Moise he had stayed deep within their hearts - but he was gone. Last year, I brought Tim and Bobby together for the first time where it quickly came to light that Tim's inspiration for the indestructible ball (which I had funded the development of) had actually come from seeing Bobby's footage on CNN. There we sat, three men talking about this special ball and what the simple notion of play could mean to kids born into the most devastating circumstances. Sure kids need food and medicine, but they also need to play. They need to smile and feel joy on occasion. It's as integral to the soul - and life - as anything. I recently helped Bobby launch his new book The Power of the Invisible Sun which features a photo of Moise, his ball, and kids from war-torn areas around the world. All of his proceeds go towards the HOPE IS A GAME-CHANGER PROJECT, a fitting homage to the kids he visited over the past decade. They span the emotional landscape from heartbreak to joy, but share the undeniable undercurrent of resilience and hope. Bobby and I share the unwavering belief that delivering hope really is a game-changer, especially to a child. We believe that each indestructible ball will come to represent a lasting symbol of hope. A light no matter how small - the power of the invisible sun. This holiday season, I ask you to think about whether you are doing enough to help someone else in the world. Or as Bobby likes to put it, consider taking a "concrete baby step" - which added together, can create transformational change. It's my great hope that the HOPE IS A GAME-CHANGER PROJECT will change the lives of children the world over - one book, one ball at a time.